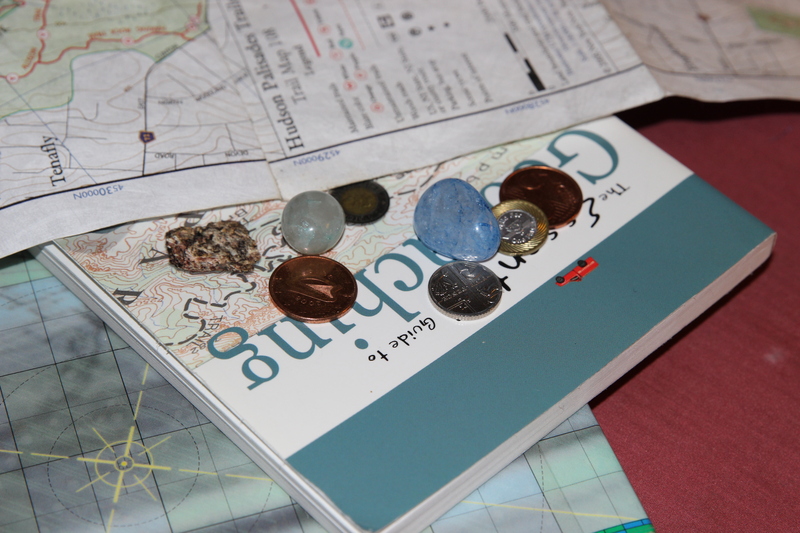 This blog posting isn’t meant to be an exhaustive (or exhausting) guide to geocaching. There are people who’ve already written books about it and who can explain it a heck of a lot better than I can. But here’s the basic definition. A cache is a little (or not-so-little) container of something that has been hidden somewhere – out in the woods, in a city park, you name it – and its GPS coordinates are posted online, so you can go out and try to hunt it down. And if you take something from the cache, the rule is that you have to add something in return. So a lot of times I carry a little bag of trinkets and knickknacks with me when I’m out hiking or walking. I’d heard of geocaching before, back when I’d really started to get into hiking, but wasn’t really sure what to make of it. In the past, when it came to hiking, I was a bit of a Luddite. I’d leave all my electronics at home except for my cell phone (for emergencies). Because, come on, hiking is about getting unplugged, isn’t it? But I was curious. So I decided to visit the main website for geocaching, Geocaching.com, and to start reading up. I began learning the lingo – caches, trackables and Muggles. We’re not talking non-magic peoples in the Harry Potter novels, dear readers – in geocache speak, a Muggle is someone who’s not a geocacher. And to “muggle” a cache is to (unintentionally or otherwise) remove or damage it. I’ve noticed, not surprisingly, that caches hidden in public parks (we’re talking city or ‘burbs parks) are more likely to be muggled than caches that are hidden off of hiking trails. Although, I went on a geocache run this afternoon in a park not too far from my house, and was pleased to see that the cache was there, after a few minutes of searching. At this stage, I’m still very much a novice geocacher. Others in the community (and there’s quite a lot of us) have reached grandmaster, black belt, ichiban, look-at-me-and-my-bad-self status. For these people, geocaching is practically a competitive sport. And the planning for some caches is pretty intense. For example, I saw a “spirit quest” marked out on the website map, somewhere around Utah and Colorado. The cache administrators had planted the caches so that their icons would show up in kind of a star shape on the map. To go hunting, you start by going to Geocaching.com, look at the map, and click on the icon for the cache you’d like to search for. That will bring up a page with more info about the cache – its general geographic location, its map coordinates, how big/small the cache container is, and a few encrypted clues about where exactly to look. You enter the coordinates into your GPS unit (unless you’ve got a device that does it automatically – more on that later). Some cachers use full-fledged GPS units – there are supposedly some models out there designed specifically for geocaching. Others use their smart phones. For my first couple of runs, I decided to try using my car’s GPS unit to see what kind of results I could get out of that, before deciding whether or not to upgrade. It worked fairly well for cache hunts that were close to streets and roads. But the farther you get into the forest, its use gets a little more limited. I now have a smart phone. One of the first apps I downloaded was the app for the Geocaching.com site. There’s actually at least two different apps: the basic one, which is free, and the premium, which you have to pay for. At the moment, I’ve gone for the basic one rather than shelling out the shekels for the premium app. It’s worked pretty well for my purposes so far. It helps that with the app, you don’t have to manually enter in the GPS coordinates – it’s already done all that for you. Plus it’s got a compass feature and a “point me” function that’s kind of useful. But that’s just my two cents. So people ask, why geocache? Yes, granted, the stuff in the caches isn’t worth much. I mean, it’s the kind of stuff you get in the vending machines outside the grocery stores – but you don’t go geocaching and expect to get the Hope Diamond. I think there’s a lot of reasons why we geocache. There’s the opportunity to go out exploring in the woods, which is reason enough. But there’s just something about a treasure hunt that gets people excited. I mean, when you’re a kid, you’ve got Easter egg hunts and scavenger hunts. Half the computer games I played in my tweens and teens (show of hands: who all here was a fan of the King’s Quest games?) involved some form of treasure hunt. Besides, when you’re out hunting for a cache, you end up noticing things that you might have missed otherwise: “That was a cool-looking moth that I saw on that rotten log.” And so forth. So my GPS-enabled phone will be coming into the woods with me a little more often now. But the iPod and everything else will stay home – or at least turned off and stowed out of sight in my pack. And I refuse to make/take calls on my phone unless it’s an emergency. I mean, I’m still a bit of a Luddite in some ways.